Do You Need Design Help? When Sacred Heart Catholic Church of Birch Run, Michigan decided to build, they wanted to replace their existing building with one that would stand the test of time. To meet this need, they contacted architect Jed Dingens, from Herrington and Dingens to make this vision a reality. Following the design phase, Herrington and Dingens brought in the general contracting firm of William Bronner and Son, and the laminated assembly firm of United Church Structures. The new facility in Birch Run is an eight-sided structure, with two classroom wing extensions. 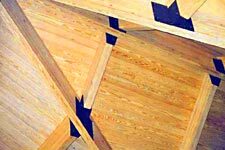 The substructure of the octagon is a laminated arch system, which uses PaceMaker's Structural Insulated Panels in the roof superstructure. 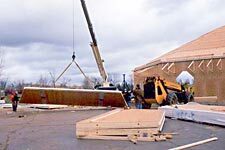 Prior to shipment on-site, PaceMaker installed the Tongue and Groove wood deck to the underside of the SIPS. By installing the interior finish in the factory, PaceMaker SIPS greatly reduced the labor cost for the project. This project went from concrete slab through timber erection, and installation of SIPS and roofing paper in seven days! PaceMaker supplies the Structural Insulated Panels used by United Church Structures. 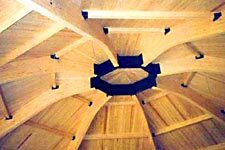 These SIPS are the core of United Church Structures' innovative roof system. 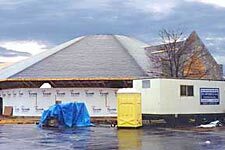 You can learn more about United Church Structures and their building process at www.unitedchurchstructures.com.